You're going to laugh, but there was a time when I would not allow my children to play kid games during the day for fear someone would see my kids playing games! I was afraid that I would have to explain why they were not in homeschool studying! That was a l-o-n-g time ago. Before I knew how important it was for them to play games. We play games most anytime now, and lots of them! Have you played a fun game? Share it with us! With over twenty years of homeschooling under our belt, we have uncovered a slew of fun games for kids that are a blast to play. Some are even educational at the same time, if you can believe that! Each link (below) will take you to another page with the games we recommend. I know you will have as much fun playing with these favorites as we do. 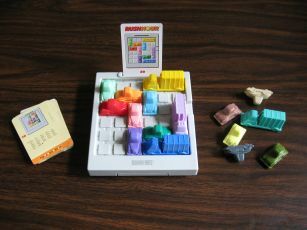 Rush Hour is a play alone strategy game. The object is to see if you can move the red car out of the traffic jam through the opening on the right (near the purple truck). We set up an example for you here. One possible move can be seen on the Educational Games page! What Fun Games Have You Played? Wait! Before you "Pass Go", share with us a favorite game you play(ed)! Click here to see the rest of the form and add your game details.